The El Toqui Mining Project, operated by Laguna Gold, is located in the far south of Chile. Ground conditions and the presence of magnetic infastructure underground make a fast, gyro-based survey method critical for success. At Toqui, measurements were previously made with a magnetic survey tool, however, even after the most stringent QA/QC was applied to the results, a high level of accuracy could not be guaranteed due to magnetic interference from infastructure. Removed magnetic interference as a risk. REFLEX, leaders in gyroscopic survey technology, proposed to survey the borehole using the REFLEX GYRO SPRINT-IQ™. This instrument is the fastest, most accurate north seeking gyro in the minerals market. A trial was conducted to test the efficiency, accuracy and reliability in comparison with the traditional magnetic method. The REFLEX GYRO SPRINT-IQ™ operates in continuous, single shot, multi shot and overshot modes and provides highly accurate survey data at speeds of up to 150m per minute. With this tool, critical decisions can be made quickly and with confidence using IMDEXHUB-IQ™ to verify, visualize and analyze data. A test was conducted at a borehole in the El Toqui Project at a depth of 110m with both types of equipment. The aim was to test data efficiency, accuracy and reliability. The traditional magnetic measurement took 1 hour and 20 minutes to complete, while the REFLEX GYRO SPRINT-IQ™ took less than 8 minutes, or 10x faster to complete the survey. In underground mine sites, metals present in the infrastructure can cause interference in readings from magnetic tools. Although similar results were achieved for azimuth and dip, the traditional magnetic tool has a possibility of error as it is affected by magnetic interference. In comparison, accuracy is guaranteed with the correct use of the REFLEX GYRO SPRINT-IQ™. The comparative analysis concluded that REFLEX GYRO SPRINT-IQ™ was faster and provided more reliability in terms of data, as it was not affected by magnetic interference. The method was 10x faster and thus significantly reduced the risk of hole collapse. A hole collapse can cause loss of an instrument or measurement data. IMDEXHUB-IQ™ allowed the client to obtain data in near real-time via the cloud-based portal. 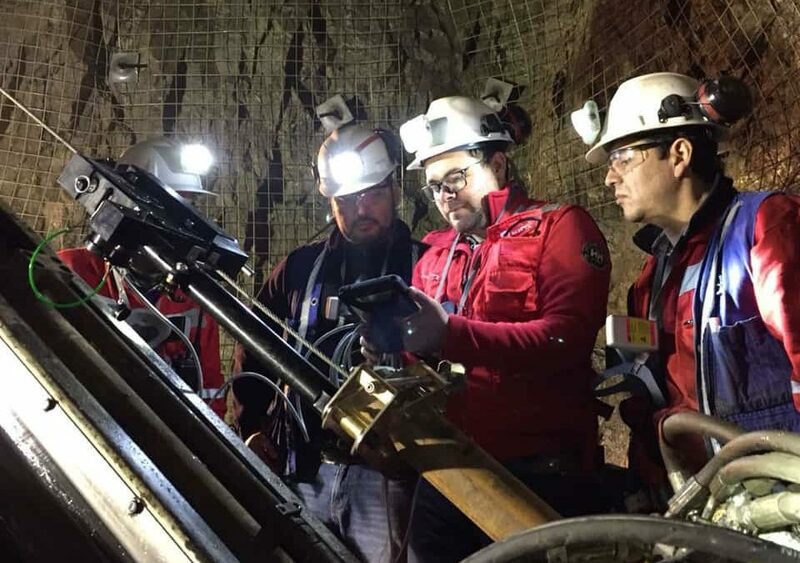 Professionals from El Toqui mine were pleased with the implementation and results of the new technology which offered them faster and more accurate measurements regardless of magnetic interference. Success in utilizing the REFLEX technology not only saved time for crews but also enabled better decisions due to the reliable data.